If every request being sent inside a hospital is labelled "stat", are any of them truly stat? Healthcare needs to revisit the way information is transmitted and requested. Workflows are improperly used, resulting in poor communication, weak results, and subpar patient experiences. In an industry inundated with legal and regulatory woes, what can be done? 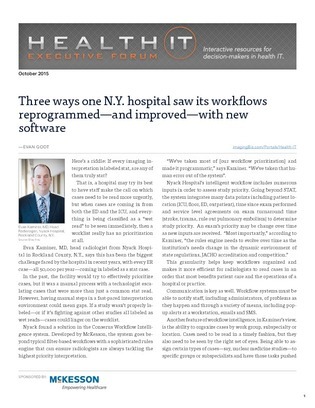 This whitepaper considers how one New York hospital re-evaluated their communication workflows, and shares their improvements. Read on to see how software is reshaping the industry, and how your organization could see similar results.